Something about summertime and beach trips begs for bright, colorful nails with fun designs! Dress up your fingernails or toenails and celebrate the sun and sand. Beachy nail designs don't have to be intricate like this turquoise style with gemstones and glitter, though they can if you want them to and have the time to spend. Whether you choose solids in the brightest and boldest of shades or embrace your inner nail artist with a floral, glittery, or dolphin design, there are plenty of options to consider! What says seashore like wispy green lines, waving against the backdrop of your natural nails, accented with crystals and well-placed bubbles? To get this look, paint a soft green just at the tips of your nails, then use an eyeliner brush to make haphazard lines toward the middle. Use the same brush to make the white bubbles, then apply clear polish after that dries. Before the clear polish has set, use tweezers to apply rhinestones. Perfectly pretty with a fun and funky twist, you'll be the nautical princess with an ocean-inspired nail design encompassing a different, unique design on each nail. Each miniature work of art alludes to an element of the perfect beach vacation, from the fun anchors and cocktails to a gorgeous tropical sunset and wonderful sea life. Take a few examples of what the beach means to you and make designs that are all your own. Take inspiration from the ocean, gleaming under the summer sun. This mix of blues, pink, and silver will be eye-catching on fingers or toes. Take French tips for a new twist with an ocean-inspired nail design! The bold but simple blue and white design pictured here echoes the gentle waves and calming sky. Want something softer and barely there instead of the typical bright colors or aquatic themes? A sheer pearlescent polish with glitter as a base, paired with a few well-placed brush strokes, will give you a sweet, feminine floral design that complements a sunny day and a summer wardrobe. Sunny yellow is a perfect summery, beachy color for nails, and it can complement a tan nicely. A fun accent, like the bold hibiscus flower on this pedicured nail, stands out for a sensational design. White nails look fresh and clean, especially for summer. Adding some gorgeous flowers in pink, purple, and yellow take them from boring to brilliant. To add the tiny beads, use tweezers with a precise tip (like the Tweezerman brand) and attach them to the still-drying clear top coat. For a more subtle take on white nails, try a classic French manicure with a pretty accent on one nail. This look is simple and fresh while offering subtle elegance, and is perfectly beach-appropriate. This is one you could easily do yourself with a kit you can purchase at the drugstore, plus a couple of nail stickers or a steady hand with a brush dipped in sparkling silver polish. White is also the perfect accent for bold, beachy nails, because it really stands out against the bright aquas, blues, and greens that are such fun colors for beach nails. Dress up a single accent nail with a few drops of white polish, a couple of rhinestones, and a small brush dipped in black polish. At first glance, these hot pink nails are just bright, fun, and perfect for summer. However, if you look more closely, you'll see that the silver lines are like flip-flop straps, making them even more appropriate for hot weather and trips to the beach. You can create this style on your own with your favorite bright polish, an opaque silver, and a nail sticker (optional). You don't have to be an artist to create this style. GummiNails.com's Candy Beach design ($16) wraps your nails in items that epitomize the summer - a beach ball, bright stripes reminiscent of giant umbrellas in the sand, and more. Click the "More details" button on the image for purchase details. This is an ombre polish style topped with a summertime silhouette of palm trees. The pink, orange, and yellow in the back make up a beautiful tropical sunset. 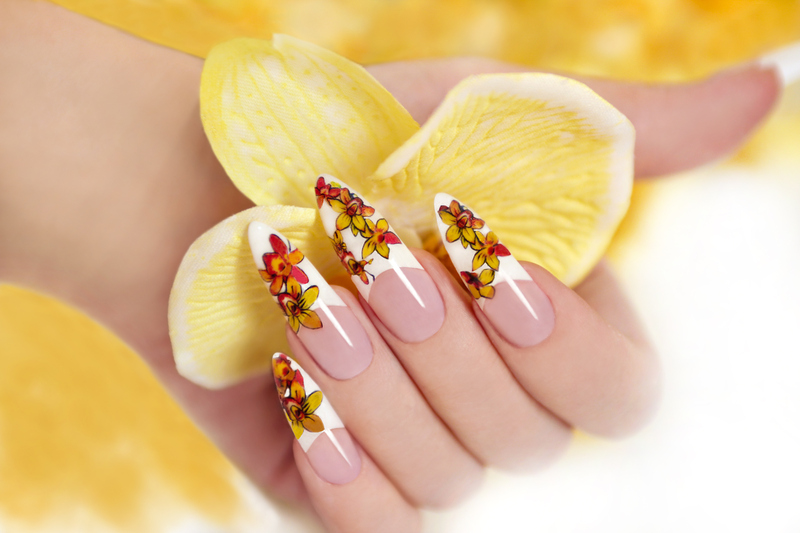 With some practice and a nail art brush, you may be able to do this alone, but if it's your first try at nail art, it may be best to enlist the help of a professional or a friend with a steady hand. A cheerful rainbow on your feet or hands is not only perfect for hot weather and beachy nail designs (think beach balls and umbrellas! ), it's incredibly easy to create, too. For best results, look for polishes with the same type of finish, like cream or frost. This will add cohesiveness to the look even though you're using five different colors. This would be a beautiful beach design for all your nails or just a single accent nail on one or each hand. It's probably best left to the professionals unless you're pretty skilled and experienced in nail art. This is a design you can definitely do yourself with the help of some nail guides (look for them near the French manicure sets). Place one on each fingertip where you want the sandy shade to go, then paint the tips of your nails. Once that's dry, go back with a glittery blue nail art pen to make the stripe of water just below it. Seal everything with a clear topcoat. Who says the most beautiful beachy nails have to have ocean colors? These nails were inspired by the neutral tones and curves of seashells. By focusing on the nail tips, there's an extra bit of elegance similar to that of a French manicure. If your nails are shorter, you can have a similar pattern created across the full length of your nails for a look that's just as stunning. Since summertime calls for showing off your feet and gorgeous nails, take some extra time to moisturize your hands, apply SPF to them, and make your feet look pretty and ready for their flip-flops.